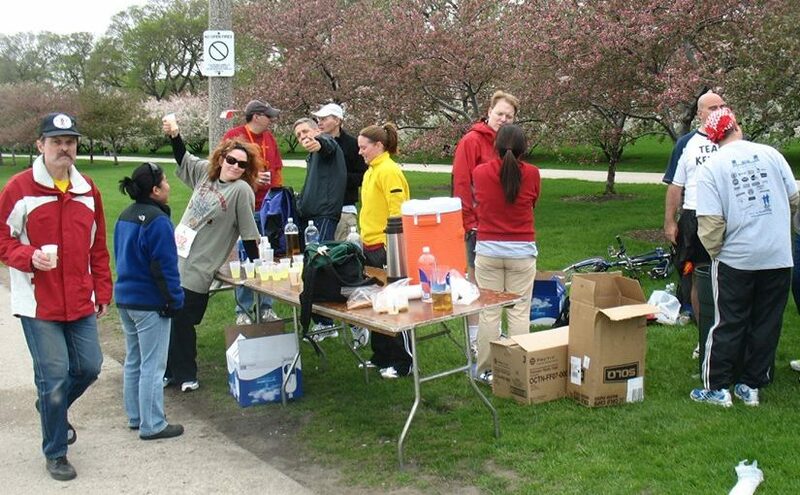 Every now and again member of the Chicago Hash House Harriers get together for things other than Hash Runs – these are Hash Social Events. When, where, and what these entail can vary wildly, but they’re great opportunities to have fun with your hash friends without needing to do that silly little “exercise” thing. Hash Ball is not your typical hash run in that there is no actual trail, but rather it is a gathering of all of the members of the Chicago Hash House Harriers to celebrate surviving the prior year of hashing. At Hash Ball members get together for food and drink and to give out awards to each other for their accomplishments throughout the year. Every year there’s the Chicago Marathon, and every year some crazy hashers sign up to run the damn thing. To make their experience a little more tolerable, members of the Chicago Hash House Harriers get together for the Marathon Beer Stop. Hashers are encouraged to bring beer, cups, and signs to cheer participants on. The Shamrock Shuffle is a ridiculously large race and they give away a free drink ticket to everyone who participates. Everyone. There’s so many free tickets that people don’t use that some bright hasher got the idea to collect them and get a whole bunch of drinks for free. Beer in a Box was born because they’d collect so many tickets that they’d need a box to carry the beer back from the beer stand. Want to come out and enjoy some beer and wings? On top of that, we hold discussions about how you can become a better hare. That’s right, its Wingsday & R Tard E Haring School – what else do you have to do on a Wednesday night? Laundry?